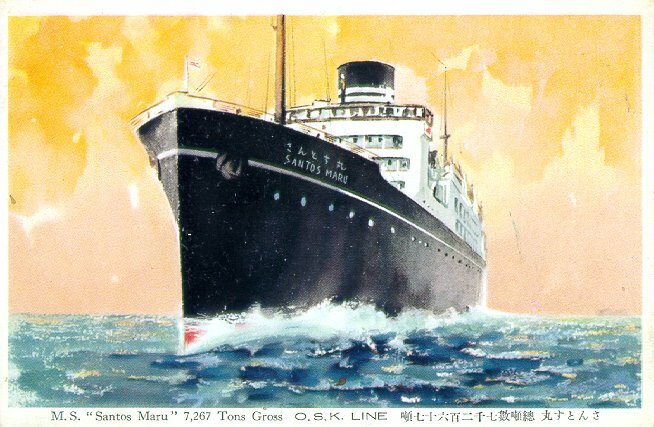 In November 1925, Santos Maru entered service on OSK's westbound round-the-world service to South Asia, South Africa, the east coast of South America and the Gulf and Pacific coasts of the United States. Withdrawn from service in April 1940, Santos Maru was converted into a submarine tender in 1941, and later served as a troop transport. She was torpedoed and sunk by the USS Atule in the Sulu Sea on 25 November 1944.